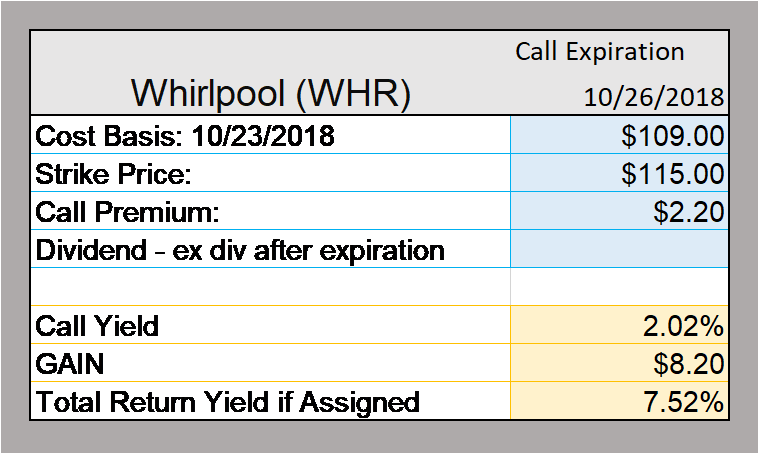 Today my alert bell rang regarding high call volumes on Whirlpool, symbol WHR. This stock has suffered mightily because the cost of their materials is going up. Meanwhile, Whirlpool continues to sell washing machines but their earnings have taken a hit. I doubt that Whirlpool will go belly up in the next few days. Therefore, I love this trade. Buy WHR at just above the 52 week low of $102.85 and sell an October 26, 2018 $115 for $2.20. Schwab shows 171 contracts traded which shows some serious intent on the call buyers. Another idea is the $113 strike price (same expiration) for about $2.70 with over 1,700 contracts traded. I just think WHR is oversold. They took a big adjustment against earnings last quarter. I am not all in on this stock; WHR provides the opportunity to get a high dividend, 4.4% yield, if you end up holding it for a while and the chance for a quick 2% yield on the call premium. Should you be stuck with WHR after the expiration you can take some solace in the fact that the experts predict WHR's future P/E (price earnings ratio) will be in the mid teens. Tomorrow I hope to make a trade similar to the one outlined below. Let's see if it materializes. The key to this trade is the call yield. As you know, options' prices vary significantly so you have to be vigilant. Good income investing. During volatile times, the vigilant income investor can put money in the bank.